"Though the Greek and Roman crewmembers of the Argo II have made progress in their many quests, they still seem no closer to defeating the earth mother, Gaea. Her giants have risen—all of them—and they're stronger than ever. They must be stopped before the Feast of Spes, when Gaea plans to have two demigods sacrificed in Athens. She needs their blood—the blood of Olympus—in order to wake. The Athena Parthenos will go west; the Argo II will go east. The gods, still suffering from multiple personality disorder, are useless. How can a handful of young demigods hope to persevere against Gaea's army of powerful giants? As dangerous as it is to head to Athens, they have no other option. They have sacrificed too much already. And if Gaea wakes, it is game over." Well it is over. It has been quite the journey and we have reached the end. I have really enjoyed following these characters over the last five books (or ten books if we are talking about some characters). As with any conclusion it is always hard to say goodbye, but I definitely feel satisfied with the way everything came together. Before I discuss the things I enjoyed about the book, I first want to go into the one thing that I was really really upset over. I was so upset that we did not get a lot of Percy in this book and that he didn’t have any chapters. I get it. This series is not just his story, these books are a combination of many characters BUT I can’t help but think that this series wouldn’t even exist if it wasn’t for the first Percy Jackson books and I just feel a bit cheated as a reader that in this final book I didn’t get a lot of Percy. He was really a minor character in this conclusion. Again, I know it’s not his story, but I was kinda hoping that since this is the last time we were going to see him that he would have had a bigger part to play. 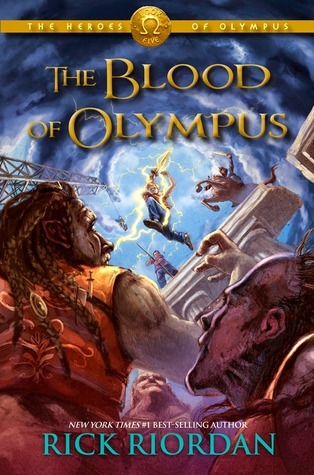 Other than the lack of Percy I did really enjoy The Blood of Olympus. I really like how so many different characters come together and blend. These characters have grown so much and have gotten so strong over the course of the series. As I have mentioned in previous reviews, the amount of perspectives can be hard to keep up with but it also allows the reader to see a much bigger picture. My favorite perspectives in this book were Leo and Nico. Leo is just so funny and I really love him. I also love how strong and determined he is. He is probably my favorite character of the series outside of Percy. Then we have Nico who I really came to love. He is so lonely and my heart broke for him. I wanted him to see that he was surrounded by friends in the worst way and I was so happy with the way his story went over the course of this book. Oh and I also want to mention Jason because I really like him too but I mostly like his interactions with Percy. They are both just so funny together because they are so alike and when they are together they are such a strong force. The Blood Of Olympus was a very good conclusion and I am so sad there are no more books to look forward to but I am really glad I was able to enjoy such a great ride. Note: I wrote this review before I found out about The Trials Of Apollo and thought this was the end.. but YAY more from Percy world! I'm glad you really enjoyed this one despite that you didn't get as much Percy as you wanted. I can understand those feels... And I'm glad that there will be another book! I haven't read these yet but I keep meaning to. Glad they are good, though I'm not surprised. I swear, I really need to continue w/the PJ series. I only read the 1st book! Lol. Shame, I know.